MTP readers will remember the “Google Shill List“–a court ordered filing imposed on Google by the judge in the Oracle case that demanded Google disclose all of its paid pundits and astroturf organizations. You’ll also recall the “cy pres” scam, the millions paid to Lessig enterprises like Creative Commons and the Center for Internet and Society at Stanford. We’ve all seen Google form the fake “MIC Coalition” (or “McCoalition”) with Pandora, DiMA, the CCIA and the CEA. Not only does Public Citizen have the street cred, they also produced the most comprehensive and well-researched analysis of Google’s shillery that I’ve ever seen: Mission Creepy: Google Is Quietly Becoming One of the Nation’s Most Powerful Political Forces While Expanding Its Information-Collection Empire. Whenever you have that creeping sensation that you’re reading something in the press or a blog that sounds like it comes straight from the astroturf abattoir, look it up in Mission Creepy‘s handy index of Google shills and you’ll probably be right. But even so, it’s hard to know how much these groups got from Google due to Google’s stunning lack of transparency. This will come as no surprise to anyone who had to sign an NDA to enter any Google building, but normal folk think it’s kind of creepy. 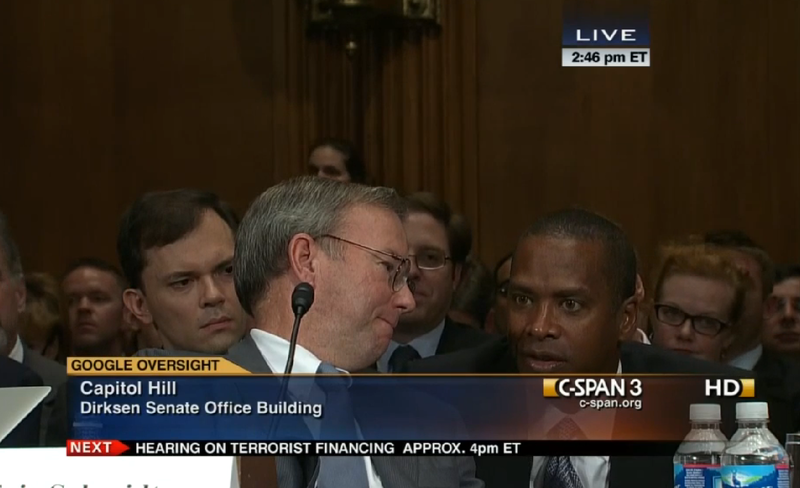 Not to mention Eric “Uncle Sugar” Schmidt taking the fifth before the U.S. Senate Antitrust Subcommittee hearing on “Google Oversight”. Lisa Gilbert is the director of Public Citizen’s “Congress Watch” (which means she has a very strong stomach). Ms. Gilbert has an interesting post today in the San Jose Mercury News in which she covers the Google shareholder meeting where Eric “Uncle Sugar” Schmidt was called out about Google’s lack of transparency in its tens of millions in shillery disclosures. The Google shareholders are voting today on a resolution calling on Google actually be as transparent as they claim to be. The idea that Google shareholders are “voting” on anything has its own special irony–Uncle Sugar, Sergei Brin and Larry Page have rigged the voting shares of Google so that they will always control the board, so they essentially control the company that disenfranchises Google stockholders. I’m sure that this irony is not lost on Ms. Gilbert, and if Uncle Sugar was going to worry about anything it’s that Public Citizen not only has focused on how much walking around money Google is shilling out, but that they are also focused on a shareholder vote. Because Public Citizen is exactly the kind of organization that could bring a highly credible complaint to the Securities and Exchange Commission about that disenfranchisement. And that’s the kind of thing that could ruin Uncle Sugar’s whole day. As anyone in the music business can tell you, Google doesn’t give a good goddamn about what anybody thinks until they are made to do so. That’s called the YouTube data honeypot, for example, a bunch of people who really do not care at all about anything other than feeding their own snout. Google is a major federal lobbyist, spending more than $17 million in the election year of 2014 — ranking No. 2 among U.S. companies. It has spent $5.1 million in the first quarter of 2015, the second most it ever has spent in one quarter. That’s the stockholder’s money, by the way. I wonder if they know that YouTube are a bunch of bloodsucking thieves? Google also funds some 140 dark money trade groups and nonprofits, including ones like the U.S. Chamber of Commerce that lobby extensively. Other companies, including those in the tech field, such as Microsoft, publicize how much money they provide to nonprofits and associations that play in politics. Google should do the same….For investors the stakes are high: The Google brand is about more than just business….Google’s dedication to making the Internet accessible and transparent is one of the core reasons users genuinely admire Google products. Because Google’s brand is so strongly tied to these principles, it is a big problem that the company has not yet moved to disclose its own political spending. This lack of openness not only runs counter to the values that have made Google such a strong company, but also represent a real threat to Google’s brand integrity. In fact–it runs so counter to Google’s supposed “values” it makes you wonder which is reality. Well, not really. We know which is reality, it’s more like how in the world do they get away with the “don’t be evil” BS. The 2014 CPA-Zicklin Index of Corporate Political Disclosure and Accountability, which ranks the political disclosure policies of the nation’s public companies, shows us that other tech companies like Microsoft, Intel and Qualcomm are among the nation’s top disclosers. Google scored in the second-lowest tier of companies. Really? Who was below them? Pandora or SiriusXM?